Enjoy it while it lasts, because the freebie UFC Fight Pass days are nearly over. Starting on Saturday, the Octagon’s new online network will begin charging its subscribers $9.99/month to enjoy its content. Of course, the only way fans will be able to watch Saturday’s “The Ultimate Fighter: China Finale” card is via UFC Fight Pass. The UFC had been offering a free two-month trial to help build Fight Pass’ popularity. 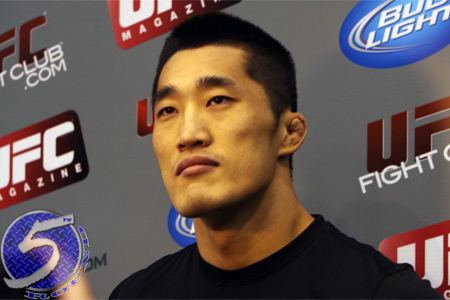 A pivotal welterweight affair between Dong Hyun Kim (pictured) and John Hathaway headlines the gig. The show was also expected to feature the finals of both TUF China tournaments, but an injury forced the postponement of the featherweight finale with Jianping Yang and Guangyou Ning. That scrap will be rescheduled for a later date. Sai Wang meets Lipeng Zhang in the TUF China welterweight finals. The first fight kicks off bright and early at 3:15AM ET/6:15AM PT in America. CotaiArena inside the Venetian Resort in Macau, China hosts the event.